Paradise Bungalows, originally built in the late 1930’s, have amazed guests with their charm and cleanliness. All cabins have been completely renovated to modern standards and offer a cozy, elegant mountain flavour with all the comforts of home. 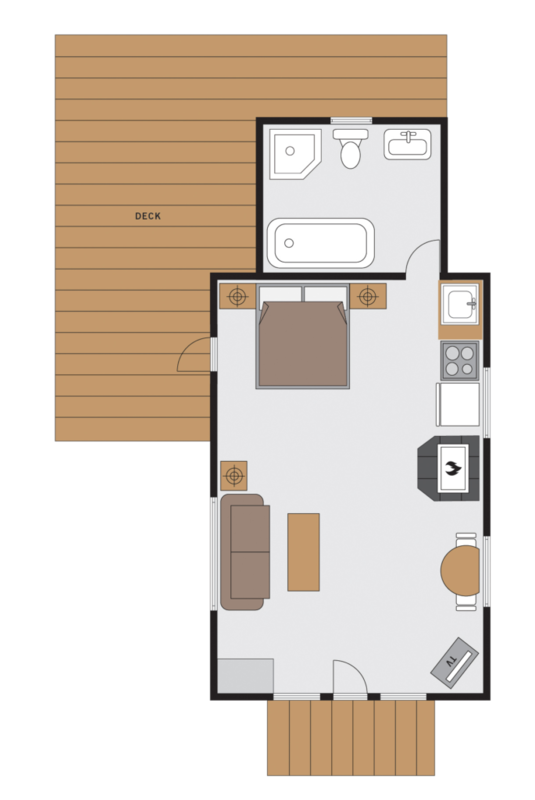 All cabins are complete with bed linens and towels and units with kitchens are complete with pots, pans, dishes, etc. 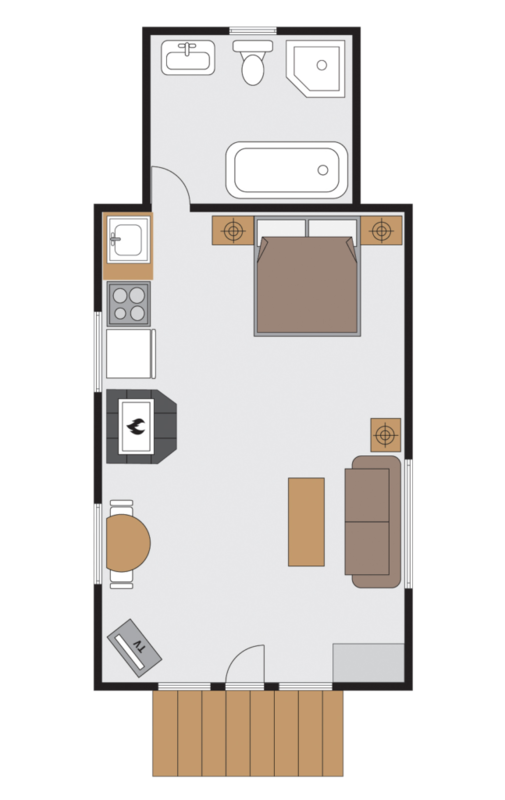 All units without kitchens contain mini-fridges, microwaves, and coffee makers . Please note we have chosen not to put phones in any cabins, and all cabins are non-smoking. There are 4 types of cabins each named after influential historical individuals from the immediate area. 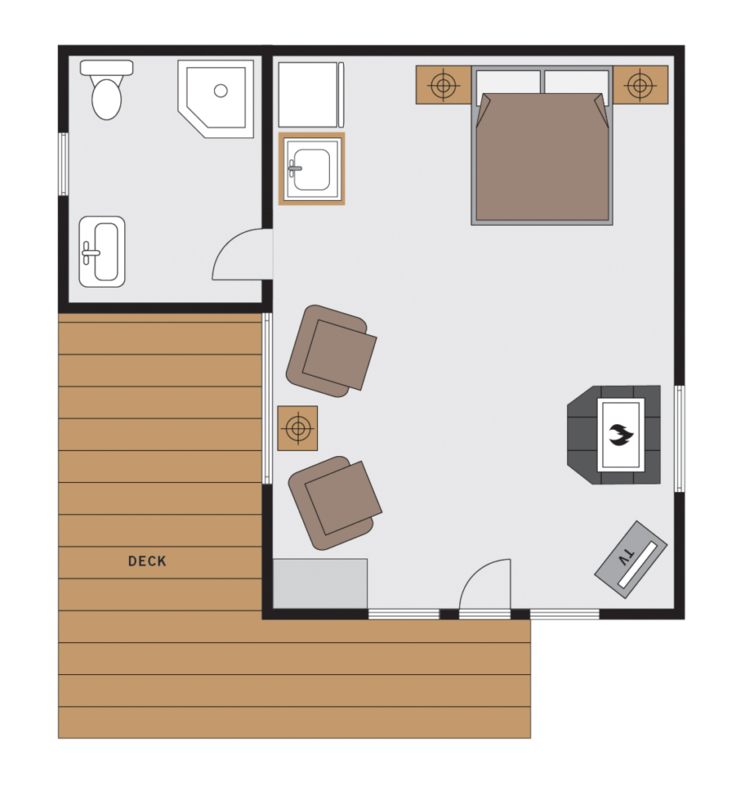 Cooper and Peyto style cabins have spacious bathrooms with claw footed soaker tubs and corner showers. Wilson style cabins are the smaller of the cabins and are located in the centre of the property. Each cabin has parking conveniently located beside it for easy access. 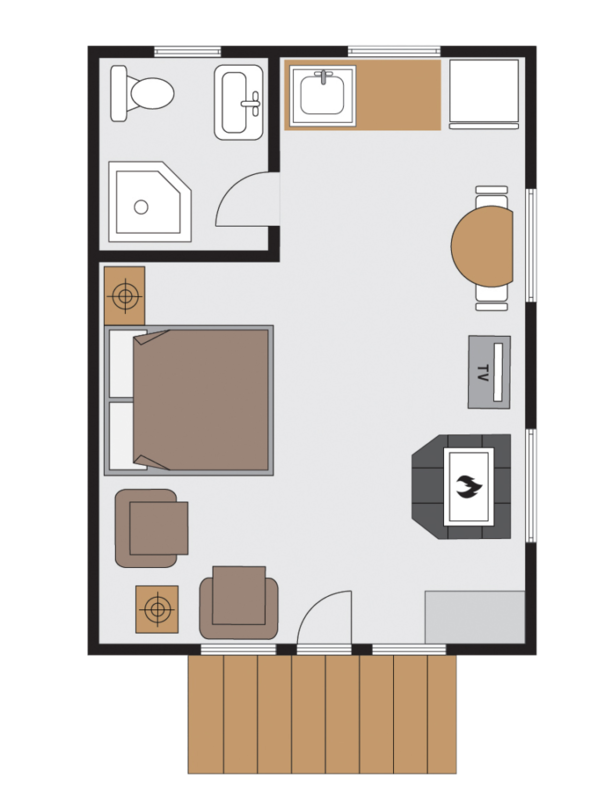 Please note that while our cabins are individually named after mountain peaks in the area, the floor plan styles are also uniquely identified according to the names of historic personalities who frequented these mountains. Named after Edward Feuz II , one of the early Swiss Guides of Lake Louise. One-room cabin with one queen bed, cast iron gas fireplace, bathroom with shower, convenience area with fridge, microwave, coffee maker and balcony with view. Named after Tom Wilson, the explorer responsible for discovering Lake Louise. One room cabin with one queen bed, cast iron gas fireplace, bathroom with shower, convenience area with fridge, microwave and coffee maker. Named after Bill Peyto who was a guide and outfitter in the early years of the area. One room open concept cabin with queen bed, pull-out sofa, cast iron gas fireplace, kitchen facilities, bathroom with claw foot soaker tub and corner shower. Named after Alfred Cooper who was the original builder/owner of Paradise Bungalows. One room open concept cabin with queen bed, pull-out sofa, cast iron gas fireplace, kitchen facilities, bathroom with claw foot soaker tub and corner shower. Also features balcony with view. During the season we have daily rates only. Off-season rates available. If cancellation is received 14 days prior to your arrival, the deposit will be refunded. If canceling within 14 days prior to your arrival, 100% of the first night’s deposit is non-refundable. All cancellations must be received in written format. Please note all of our rooms are non smoking. Please note, cabins will NOT accommodate extra guests above capacity.